Stargazers are in for a huge treat this weekend if skies stay clear enough. A newly discovered comet, named Jacques, will be visible in the sky over the next few nights in what is being described as a once in a lifetime event. It will also be close enough to the Earth that you will not need any special equipment to see it. Jacques was recently spotted by Brazilian astronomers back in March and typical of any comet, it kind of came suddenly out of nowhere. 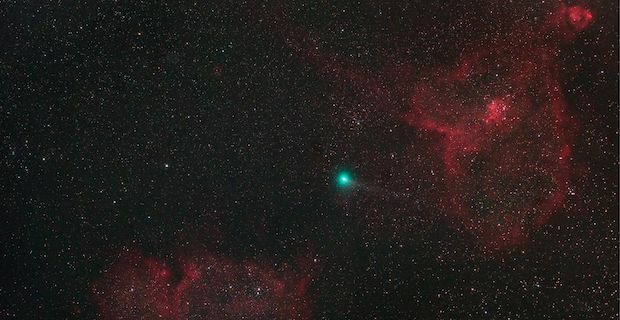 Earlier this week, the comet was captured in all its glory in a telescopic photograph(above) where it can be seen flying by in the foreground of Cassiopeia's Heart and Soul Nebulae. It burns bright green due to it's make-up which consists of carbon and cyanide gases. You will be able to view Jacques in the northeast all through the night as it passes by Earth at a distance of just 50 million miles. For all stargazers, novices included, the comet will be easy to spot tonight once you identify the iconic W shape of the Cassiopeia constellation. Once Cassiopeia is in your sights, focus in on the bright star at the start of the W on the top left and there you will be able to spot Jacques burning bright. More experienced astronomers will be able to view the comet for the next few weeks as it continues on its' space adventure. Be aware that this type of event happens quite rarely though so if you are interested in seeing Jacques then make sure you get outside in as dark a place as you can find and download the Google Sky app as some added insurance to help you locate Cassiopeia.